Ab46983 recognizes Histone H4 acetylated at lysine 12. Serum did not react with non-modified Histone H4 peptide or peptides acetylated at lysines 5, 8 or 16. This information is considered to be commercially sensitive. Our Abpromise guarantee covers the use of ab46983 in the following tested applications. WB 1/5000 - 1/20000. Predicted molecular weight: 11 kDa. ab46983 tested by ChIP analysis. 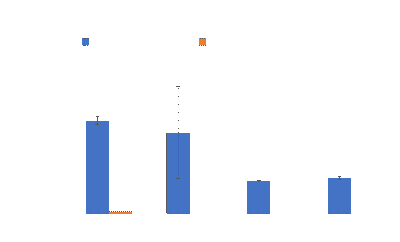 ChIP performed using Hela chromatin (1.5 x 106 cell equivalents per ChIP) and 10 ul of ab46983 or the equivalent amount of rabbit IgG as a negative control. 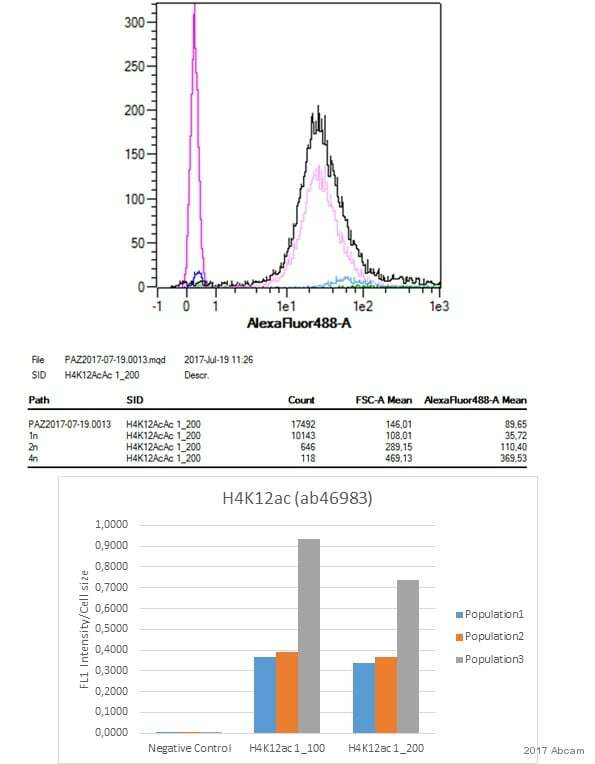 Real time, quantitative PCR (RT-qPCR) was performed on DNA purified from each of the ChIP reactions using a primer pair specific for the indicated gene. Data are presented as fold enrichment of the ChIP antibody signal versus the negative control IgG using the ddCT method. 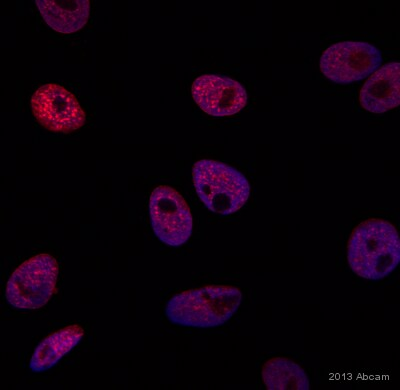 Staining of HeLa cells with ab46983 at a dilution of 1/500. ab46983 staining Hela cells at 1/500 (top image) and DAPI (bottom image). ab46983 in dot blot (top panel), acetylated peptides corresponding to the immunogen and related peptides were spotted onto PVDF and probed at a dilution of 1:1000. The amount of peptide (picomoles) spotted is shown next to each row. Lane 1: Histone H4 acetyl-Lys5 peptide. Lane 2: Unmodified Lys5 peptide. Lane 4: Unmodified Lys8 peptide. Lane 6: Unmodified Lys12 peptide. Lane 8: Unmodified Lys16 peptide. ab46983 in WB (bottom panel)at 1/2000 with whole-cell extracts (35 ug/lane)from wildtype yeast or yeast containing a mutated histone H4 gene. Lane 2: H4 N-terminal tail deleted. Lane 3: Histone H4 K5 to R.
Lane 4: H4 with K8 to R.
Lane 5: H4 with K12 to R.
Lane 6: H4 K16 to R.
Lane 7: H4 K5, 8 and 12 to R.
Publishing research using ab46983? Please let us know so that we can cite the reference in this datasheet. 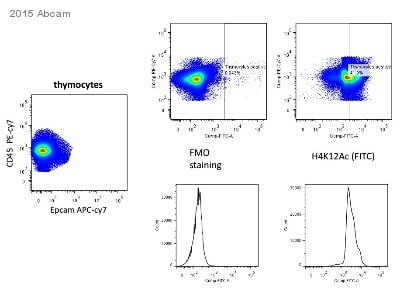 Another company antibody was used. Cell populations were gated according to their DNA content.